Shore area snow lovers will get one more chance to bask in the winter wonderland, though a nor’easter expected to develop Saturday night into Sunday will produce only minimal accumulating snow and is not expected to greatly impact travel. 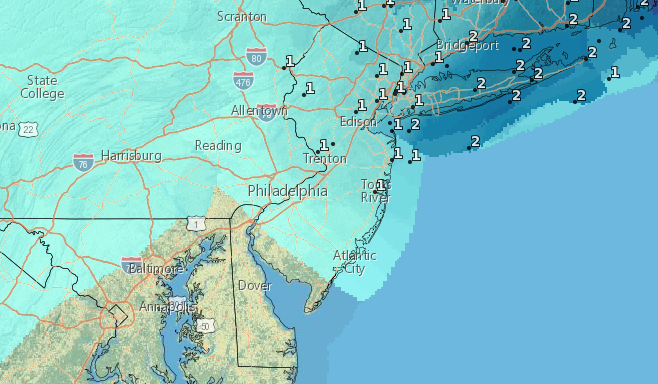 Only about one inch of snow is forecast to accumulate in Ocean County, mostly on grassy surfaces. Snow will begin to fall after 2 a.m. Sunday morning, the National Weather Service said in a forecast. The snow will continue until Sunday afternoon, at which point it will change to rain, possibly mixing with snow and sleet at times. Rain and sleet, possibly mixed with snow, will continue until about 8 p.m. Sunday, at which point any remaining precipitation will change to snow. The high Sunday will be 38 degrees; the overnight low Saturday into Sunday will be 33 degrees. The storm is expected to produce breezy conditions Sunday, with winds sustained between 18 and 21 m.p.h.